TheRustedChain - The Blog: Weight loss.... Let's discuss again! Weight loss.... Let's discuss again! Last year at this time, I blogged that I had been losing weight. I'd done it quietly up until that point. The truth is I don't like talking about this subject at all. I'm embarrassed of how out of shape I was. You can see my original weight loss post here. As of today, I'm down 42 lbs. I'm 5'3" and as I've gotten smaller, the weight loss has certainly decreased in speed. I'm a mom of 3 and run 3 businesses. Just like you, I don't have time. But I make it. - I don't belong to a gym, don't have a trainer, don't take any special shakes or pills, don't do dvd's. (there's nothing wrong with them, they just bore me.) I'm not selling anything. - It's taken me about a year and a half. I don't really "run" but I'm a big fan of interval training. Walk/jog intervals (wogging) - walk for a few minutes, jog for a few minutes, walk for a few more, etc. I generally do 1.25 miles a day. (not much!!) I prefer to be outside, but if the weather doesn't cooperate I do it on the treadmill. After that I'm more focused on strength training and I change that up quite a bit. - I do a lot of squats, jump squats, weighted squats, and lunges. Occasional burpees. - Push-ups. Lots of those too. And inverted push-ups where my feet are elevated on a step, chair, or bed. - Abs: I hardly ever do them. I should, but usually just forget or wimp out. Maybe soon I'll start doing more crunches. - I do a little bit of boxing. - I generally only do about 25-35 minutes a day. Usually it's 7 days a week, but occasionally I take a day off. Honestly, I don't like the way I feel when I take a day off. But sometimes it's necessary. - I know that my time is extremely limited, so I try to make those 25-35 minutes as intense as possible. FOOD: I like it. I like it a lot. And I eat a lot. Goodness knows I eat "real" food...normal food. Burgers, tacos, pasta, steak, etc. I do try to keep my protein amounts high simply I hate feeling hungry. I work out so hard, I get hungry a lot. High protein helps combat that. I enjoy ALL food groups and don't eliminate anything from my diet. I eat carbs, sugar, and fat. I eat salads, but probably not as many as I should. Usually I try to have a glass of water or piece of fruit with a meal. And I make myself eat the fruit first, before the good tasting stuff, because otherwise I just won't eat it. I don't count calories, but do pay loose attention to them when possible. If something tastes amazing, it's worth the work it'll take me to burn it off. If I take a bite or two of something and it just tastes "meh", I move on. As spoiled Americans we generally have plenty of food around us. I try not to waste my caloric budget. If you'd like to see all the posts I've done about weight loss, click here. Truly, it's just a mind shift. There's something incredibly empowering about setting your mind to something and achieving it. Sure, I've had my frustrations along the way but I've pushed through. Worked harder. Dug deeper. I probably have about 5-7 more pounds I could lose, but I'm not super concerned about the scale these days. My focus for 2016 is to see more muscle definition. 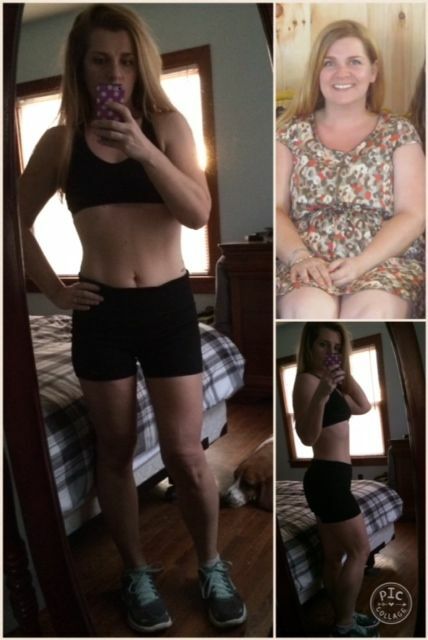 I promise you, if I can do it, you can too! Do you have any specific questions? I'll try to help! You've been motivating me for as long as I've known you. I just turned 50 and decided this is the year I follow in your footsteps. Now that's the kind of motivation and inspiration I needed to read! Thanks for sharing! Congratulations! I've struggled with my weight for a long time. Am recently down 11-12 pounds, with maybe another 25 to go. I just changed what I was eating. I'm not counting calories, it just gets too boring. Have you cut your portions in half or anything like that? You looks awesome and you've accomplished a lot. Way to go! Gorgeous before, gorgeous after. You're awesome!! !